I personally cannot believe the quality of the Sunsella Pastry Scraper and Chopper. For $16, this awesome kitchen gadget is a must have. It is sturdy and so well designed that I’m thrilled to have been asked to review it. By now, my fantabulous readers know that I love to cook and two of my favorites are scones and focia bread. The Sunsella Pastry Scraper and Chopper does so much more … from quickly chopping vegetables to the perfectly iced cake and delicately scored pastries to cutting the perfect ravioli! Visiting the Sunsella Amazon page gave me 1,000 more ideas for the gadget! 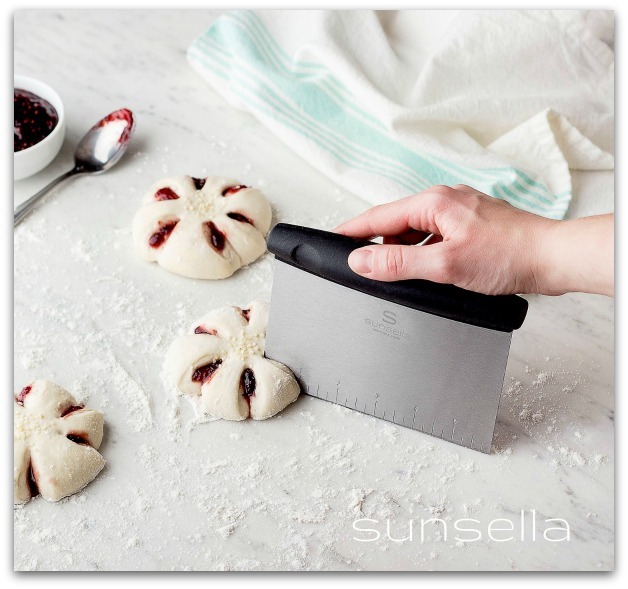 The Sunsella Pastry Scraper and Chopper lists for $21.99, however it is currently on sale for $16. This is an ideal gift for any cook … even yourself!